What Are Loofahs Made Of? Although natural loofahs resemble their bathroom counterparts, they're actually about as unrelated as it’s possible to be. The loofah you scrub with is a dried-out tropical or subtropical gourd belonging to genus Luffa (most often either species L. aegyptiaca or L. acutangula). And while no one is completely sure where it originated—as W.M. Porterfield wrote in a 1955 Economic Botany article: "[c]ultivation of the sponge gourd is of such ancient origin that it is impossible to determine whether the original home was in Africa or Asia” [PDF]— a study in 1990 indicated that it was probably first cultivated in India. These plants—which look a bit like giant cucumbers—grow year-round in almost any tropical climate and places that have warm seasons, so long as there is plenty of moisture and no risk of frost. 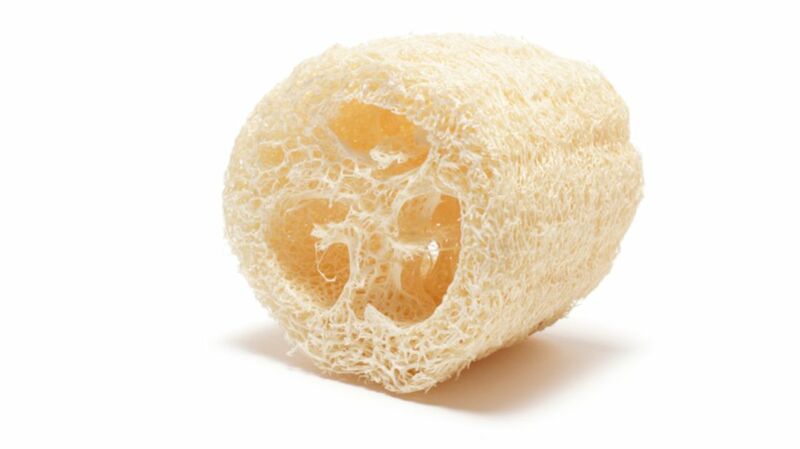 Like sponges, the fibrous dried luffa has likely been used in Egypt and Asia for up to a couple thousand years. But its biggest boost as a cleansing tool began in the early 1890s, when Japan started cultivating commercial luffa crops for international export. (Prior to that, luffas were mostly used when a thorough household scrubbing was in order.) Word spread about the exfoliating item just as bathing suits and hemlines began retreating in the late 19th and early 20th centuries, according to The New York Times Magazine, which left many women with newfound anxiety about the smoothness of their skin. Inventions like the Improved Bathing Mitten, patented in 1889 by Judson S. Snyder of Brooklyn, New York, transformed the large gourds into easier-to-handle versions. By 1893, “no one seemed able to agree on how to spell the name of that sponge, but it inspired such a craze [that one] expected to see ‘a ‘loafer,’ ‘luphar,’ a ‘loopa’ or a ‘loofah’ in every wash basin the land,'” according to that same New York Times Magazine article. But cleaning isn't all they're good for. According to Porterfield, commercial cultivation of the plant in the 1890s also let luffas fill a wide range of industrial roles. Before the second World War, over half of imported luffa goards were used in filters (chiefly in the Navy) for everything from steam to diesel engines. They also found use as water filters, industrial scourers, and even surgical tools. After wartime conflict drove Western powers to start sourcing their luffa shipments elsewhere, the dried veggies continued to prove useful through the mid-20th century as an effective sound-proofing material for tanks, helmets, and certain kinds of buildings. When man-made materials began taking over many industrial roles in the 20th century, the noble luffa was mostly returned to its role as a cleaning tool—and, of course, a popular food, one that easily stands in for cucumbers or summer squash while it’s still immature. The vine is so easy to grow that it has been floated as a candidate for a profitable, sustainable crop to help drive economic and agricultural development here in the U.S. as well as countries like Paraguay [PDF]. Because they’re so resilient, luffa vines can be easily grown by amateur gardeners in much of the country (apart from the upper Midwest and New England), so feel free to take a whack at rearing this useful gourd—just make sure that any luffas that find a place in your bathroom don’t end up being a farm for bacteria themselves.